Jonathan and Steve arriving at a checkpoint. This past Saturday morning at 9:00 AM, my son Jonathan and his teammate Steve took their first of an estimated quarter-million paddle strokes at the start of the Texas Water Safari — the world’s toughest canoe race. The 260-mile course takes contestants from the starting point at San Marcos, Texas all the way to the finish line at the small coastal community of Seadrift. After months of preparation and long training runs down various segments of the San Marcos and Guadalupe Rivers, Jonathan is living his dream of competing in the Texas Water Safari. My oldest daughter Niki is serving as his team’s captain and is allowed only to replenish their water supply at designated check-points along the route. The rules of the race are strict and tough. No one but the team captain is allowed to touch a contestant and a contestant’s boat. My family and I had the opportunity to “see” and “speak” to Jonathan from a distance last night at one of the checkpoints. He and Steve actually looked pretty good considering they had just completed a 10-hour stretch of river in Texas heat and had slept for less than an hour since the start of the race. As for me, I have enjoyed following their progress in near real time on my computer and on my phone. The week before the race I purchased a GPS device called a Spot Tracker for Jonathan. Every few minutes, this little device sends a signal to a satellite that then transmits their location to Google maps. Without question, this was a great investment! 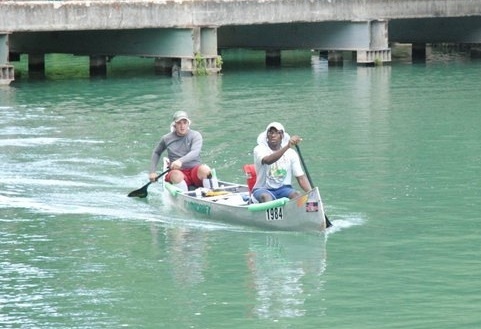 As of last night, Jonathan and Steve had paddled past the half-way mark. We are praying that they continue to make each checkpoint along the way at the designated times. 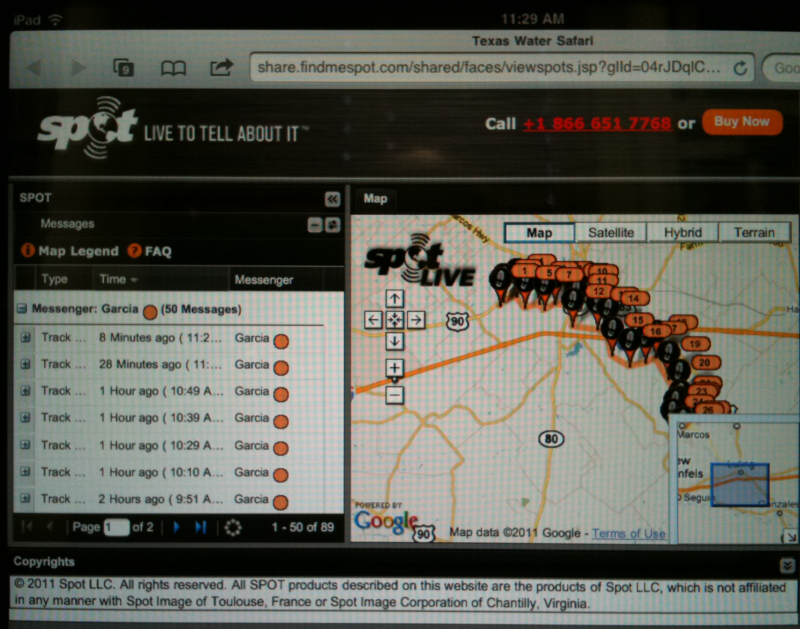 Following the race via Spot Tracker. I am intensely interested in everything that is happening along the way as my son and his teammate paddle their way toward the Gulf of Mexico. God has used my son’s participation in the Texas Water Safari to remind me of His interest in my progress. I really do want to make the checkpoints along my route. And, I want to encourage others along the way and make it to the finish line with my integrity intact so that I can hear my Heavenly Father say, “Well done, good servant!” (Luke 19:17). But, in order for that to happen, I must be faithful, persevere in spite of setbacks, encourage others along the way, and keep my eyes on Jesus. I am determined to do just that as I “press on toward the goal for the prize of the upward call of God in Christ Jesus” (Phil. 1:13). I am proud of you Jonathan, Steve, and Niki.